I vividly recall the day I took an ink-pad and a lovely stamp of a pair of swans to the timber window frames that my dad had recently sanded and oiled. When asked whether I had done it (which I now know is a parent’s way of checking in on how good their child’s capacity for telling the truth is) I replied with “It was an accident!” Ah yes, that type of ‘accident’. Remembering this incident made me enjoy the track Accidentally on the The Not-Its’ new album all the more. 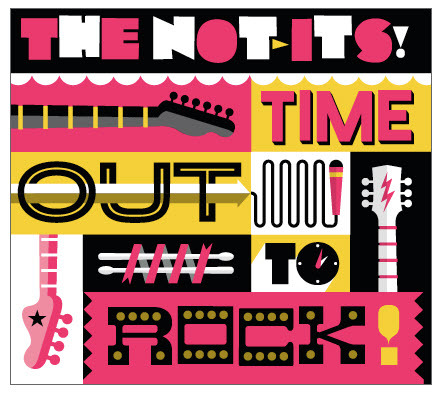 We first introduced you to The Not-Its in 2009 and since then they’ve released a second album, Time Out to Rock, that’s chock-full of the same ‘have fun’ messages and up-tempo pop we enjoyed on their debut album. Many of the songs gently deliver an important message – Welcome to Our School addresses the topic of being the new kid at a school; Time Out to Rock gives a new perspective on the ‘naughty corner’; Say it Loudly explores the issue of schoolyard bullies and how to handle conflict with friends; and Accidentally looks at what happens when things go wrong. I think the standout track is Green Light Go – preschoolers will really like the constant changes of pace and the music has a strong rock edge, with a dreamy vocal sequence that reminds me of 90s Aussie pub band, The Plums. I also love the pure-pop duet First Kid in Outer Space. Time Out to Rock winds down with the gentle Hollow Tree, the perfect vehicle for showing off lead singer Sarah Shannon’s beautiful voice. Time Out to Rock is available on iTunes for $16.99.